It's time for another Monday Made It! I actually did some calculating today, and there are only 3 more Mondays after today until I go back to work. Summer is really flying by! I love our school schedule (we get a 2 week fall break and a 2 week spring break), but I wouldn't mind a longer summer. The first day back for me is July 26th. So...I better get going on all these summer projects! 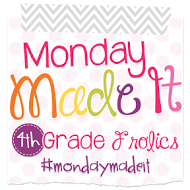 I'm linking up again with Tara from Fourth Grade Frolics for Monday Made It. 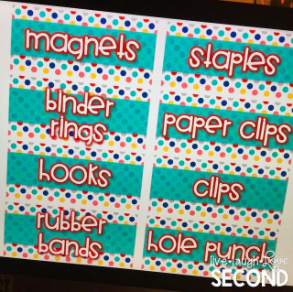 Head over to her blog HERE to see all the other fun ideas shared by teachers. 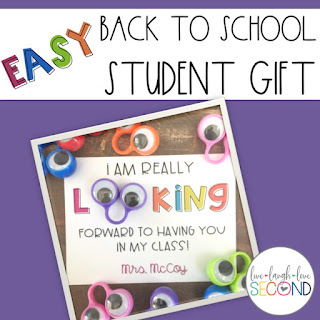 Back to School Student Gift: This is by far the most fun student gift I think I've ever made! I was looking for something crafty that I hadn't done before, and these little wiggly eyes just popped out to me while I was wandering the aisles at Target one night. The kids love using them for guided reading, and they always begged to take them home. So, this was a great chance to gift them one! They were relatively inexpensive since they were 6 rings for only $2, so I was able to snag enough rings for only $8. I printed the cards at home and used 3D glue dots to secure one eye to the paper. They are seriously the cutest things ever! You can head over to my TpT store to download the free template. An editable powerpoint file is included, should you want to personalize them. Click HERE to check it out! Well...it might not look like I did much this week, but I was in an intensive for my graduate program from last Monday through Thursday in Denver, and I was exhausted. I think I did these two projects mainly to just relax and allow myself to chill out! So...we'll see what I manage to get done this week. So cute! Thanks for sharing the free downloadable, too! I know exactly how you feel when you say you don't love it but you like it... I'm struggling myself creating my open house station signs, I like them but it's not love yet, LOL. Love your tool box, it's bigger than mine, I may need to check into it. Oh and I LOVE the labels you came up with too! Super cute welcome back gifts! I just printed mine for this year (I am using glow sticks), but I downloaded your template so I can try them next year! Your teacher tool box looks great-neat and clear. I'm sure it will be handy all year long! Good luck with your grad program-been there, done that! Enjoy your summer! Those cute student gifts almost make me wish that I taught littles. They're darling though! I'm sure that your students are going to LOVE them! How do you use the googly eyes in guided reading?